Senate President Wayne Niederhauser focuses on education, tax reform and massive road-funding needs. 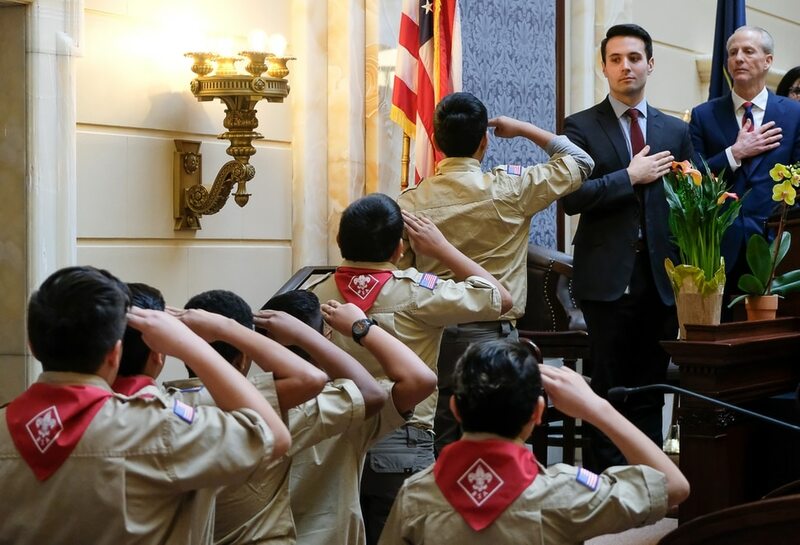 (Francisco Kjolseth | The Salt Lake Tribune) Boy Scout troop 1994 posts the colors during the opening of the 2018 legislative session on the senate floor at the Utah Capitol on Monday, Jan. 22, 2018. (Francisco Kjolseth | The Salt Lake Tribune) President of the Senate, Wayne Niederhauser, R-Sandy, gets ready to open the 2018 legislative session at the Utah Capitol on Monday, Jan. 22, 2018. 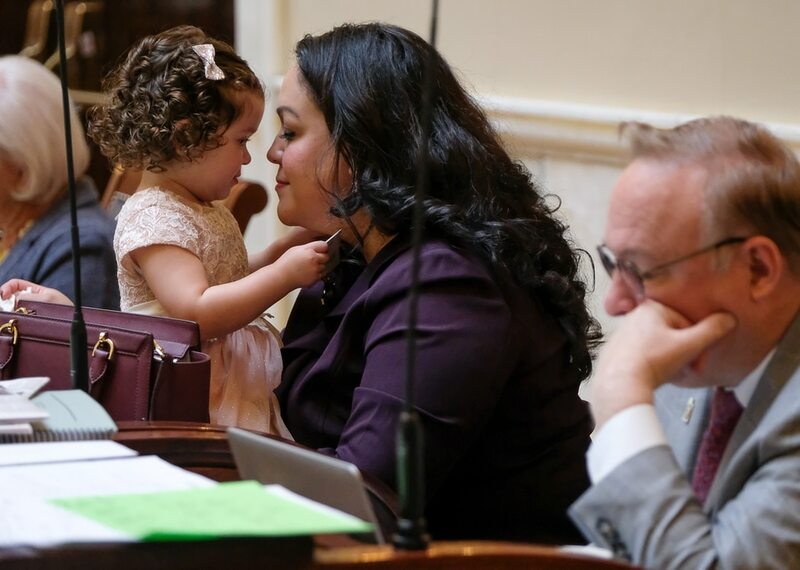 (Francisco Kjolseth | The Salt Lake Tribune) Senator Luz Escamilla is joined by her daughter Sofia, 21-months, on the senate floor for the opening of the 2018 legislative session at the Utah Capitol on Monday, Jan. 22, 2018. (Francisco Kjolseth | The Salt Lake Tribune) President of the Senate, Wayne Niederhauser, R-Sandy, waits to hear that the Gov. has been notified to the opening of the 2018 legislative session at the Utah Capitol on Monday, Jan. 22, 2018. (Francisco Kjolseth | The Salt Lake Tribune) President of the Senate, Wayne Niederhauser, R-Sandy, opens the 2018 legislative session at the Utah Capitol on Monday, Jan. 22, 2018. (Francisco Kjolseth | The Salt Lake Tribune) Senator Brian Zehnder, R-Salt Lake, is welcomed as the newest member to the senate floor for the opening of the 2018 legislative session at the Utah Capitol on Monday, Jan. 22, 2018. (Francisco Kjolseth | The Salt Lake Tribune) President of the Senate, Wayne Niederhauser, R-Sandy, gives his opening remarks following the opening of the 2018 legislative session at the Utah Capitol on Monday, Jan. 22, 2018. (Steve Griffin | The Salt Lake Tribune) Joined by his wife Krista, Utah House Speaker Greg Hughes jokes around as he gives a nervous wave to friends in the gallery as he prepares to give his opening remarks at the start of the 2018 Legislative session at the Utah State Capitol in Salt Lake City Monday January 22, 2018. (Steve Griffin | The Salt Lake Tribune) Utah Lt. Gov. Spencer Cox, second from left, and former members of the House of Representatives sing the National Anthem as they open the 2018 Legislative session at the Utah State Capitol in Salt Lake City Monday January 22, 2018. (Steve Griffin | The Salt Lake Tribune) Members of the House of Representatives, their family members and staff stand for the singing of the National Anthem as the 2018 Legislative session begins at the Utah State Capitol in Salt Lake City Monday January 22, 2018. (Steve Griffin | The Salt Lake Tribune) Joined by his wife Krista, Utah House Speaker Greg Hughes gives his opening remarks to members of the House of Representatives at the start of the 2018 Legislative session at the Utah State Capitol in Salt Lake City Monday January 22, 2018. (Steve Griffin | The Salt Lake Tribune) Utah Lt. Gov. Spencer Cox, second from left, and former members of the House of Representatives sing the National Anthem as they open the 2018 Legislative session at the Utah State Capitol in Salt Lake City Monday January 22, 2018. (Steve Griffin | The Salt Lake Tribune) Rep. Karianne Lisonbee, R-Clearfield talks about legislation that would enact important protections for children who have Down syndrome during a news conference at the Utah State Capitol in Salt Lake City Monday January 22, 2018. (Steve Griffin | The Salt Lake Tribune) Four-year-old Ella Warner, left, shares a chip with her three-year-old friend Finn Merkley as Rep. Karianne Lisonbee, R-Clearfield talks about legislation that would enact important protections for children who have Down syndrome during a news conference at the Utah State Capitol in Salt Lake City Monday January 22, 2018. Both children, who have Down Syndrome, attended the news conference with their parents Natalie Warner and Justin Merkley. Amber Merkley, Finn's mother, spoke during the event. (Steve Griffin | The Salt Lake Tribune) Dressed in period clothing Willie Nelson and Cheryl Greer, of the Golden Spike Association of Box Elder County, look into the Capitol Rotunda as they attend the first day of the 2018 Legislature at the Utah State Capitol in Salt Lake City Monday January 22, 2018. (Steve Griffin | The Salt Lake Tribune) Utah House Speaker Greg Hughes gives his opening remarks to members of the House of Representatives at the start of the 2018 Legislative session at the Utah State Capitol in Salt Lake City Monday January 22, 2018. House Speaker Greg Hughes opened the 2018 Legislature on Monday by declaring war on opiate drugmakers for doing little to prevent addiction — and by urging part-time legislators to seek more power against the full-time governor. “This is a call to arms,” Hughes, who has said this will be his final year in office, told colleagues. The Draper Republican said he became upset with the manufacturers of opiates when he opened an office in the Rio Grande area of Salt Lake City this year to oversee work there to clean up crime in the neighborhood around the state’s largest homeless shelter, and saw the horrors of addiction. He said Big Pharma, however, markets opiates by saying they are rarely addictive, improve function of patients, have few side effects and are safe for long-term use. A year ago, Hughes opened the session by declaring homelessness a statewide “crisis” and calling for an all-out attack on organized drug traffickers, especially those targeting homeless people. This year the House speaker said several bills are coming that will seek to hold drugmakers more accountable for helping to create what he says the Centers for Disease Control and Prevention calls “a national health crisis,” and allow more civil lawsuits. He has for several months been on a campaign urging Utah counties to sue Big Pharma, with the two biggest announcing plans to do so. Utah Attorney General Sean Reyes said he is on the same page as Hughes. Reyes said he is part of a 41-state coalition of attorneys general that is now investigating the opiate industry and negotiating compensation for states and its residents. He said Utah is preparing to pursue its own lawsuit if that multistate effort proves unsuccessful. He added that Utah hopes not only to gain a settlement to help with state and local programs — as states once received from the tobacco industry — but also seeks money to distribute to victims to help them and their families. Reyes said the attorneys general also will seek injunctions to stop inappropriate practices. Also Monday, Hughes suggested another, perhaps smaller, battle to give Utah’s part-time legislators more power against the full-time governor and his administration. It grows out of frustration when Gov. Gary Herbert last year refused to call the Legislature into special session to enact rules for a special congressional election to fill a vacancy when former Rep. Jason Chaffetz resigned. Herbert designed rules himself and proceeded — despite protests from lawmakers. Hughes warned that unless the Legislature acts to safeguard its powers, “this part-time Legislature” could soon be considered “a part-time branch of government.” Bills are under consideration that could allow the Legislature to call itself into special session in some circumstances. Hughes did praise the Herbert administration for generally working in concert with the Legislature to address such things as homelessness, improving education and more. Hughes said several tough issues are coming this year. One in which he also urged action is reforming the scandal-tainted Utah Transit Authority, where he was once chairman of its board. He said proposals to replace its current part-time board with a full-time, three-member commission would give better oversight and help restore public trust in UTA. He said that is important as lawmakers consider this year also allowing state highway money to be used for transit. Lawmakers have opened more than 1,200 bill files to draft legislation — and more than 300 measures have been numbered and publicly released, ready for quick introduction Monday. Senate President Wayne Niederhauser said legislators would focus during the session on education, roads and taxes. The Sandy Republican made clear he views recently approved federal tax reform as an opportunity for state tax changes, specifically income taxes. Lawmakers who will lead the way on taxes have circled around possibly cutting the number of tax breaks for various industries, collecting sales tax from more online retailers and, perhaps, lowering the income tax rate below 5 percent. The senator also said he’s recently noticed the state’s roads and highways are becoming congested, and the Legislature will focus both on how Utah will fund and manage roads in the future. Niederhauser, who has sponsored a bill that could lead to more toll roads and has specifically talked about charging for using the road up Little Cottonwood Canyon, said the state’s general fund is paying $600 million for transportation. 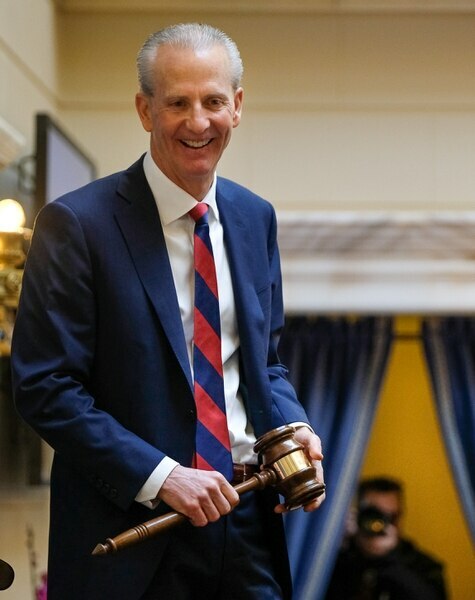 He said lawmakers would look at the “funding and governance” of Utah’s transportation systems, a possible reference to the ongoing debate over whether lawmakers will shake up the governance of UTA. Three new lawmakers, appointed to fill vacancies, are beginning their first general session. They are Sen. Brian Zehnder, R-Holladay, replacing Brian Shiozawa, who resigned to become regional director of the U.S. Department of Health and Human Services; Rep. Adam Robertson, R-Provo, replacing Dean Sanpei, who moved to Colorado; and Rep. Cheryl Acton, R-West Jordan, replacing Adam Gardiner, who was appointed as the new Salt Lake County recorder. Republicans continue to hold commanding majorities: 62-13 in the House and 24-5 in the Senate. The last time Democrats controlled the Utah Senate was 1977, and they last held a House majority in 1965 — 53 years ago. Besides Republicans, men and Mormons also hold large majorities in the Legislature. Nine of every 10 legislators are Mormon. Men outnumber women by an 83-21 majority. The part-time legislators come from all walks of life. That includes 18 attorneys, the most common profession among them. Interestingly, Rep. Mike Kennedy, R-Alpine, is both an attorney and a doctor. Sixteen members are business owners or run businesses. Another 15 are current or retired educators. Members who work in the health care industry include five doctors, two dentists, one hospital administrator and one pharmacist. Real estate-related industries also have several members: five current or former Realtors (including Niederhauser), four homebuilders or developers (including House Majority Leader Brad Wilson, R-Kaysville) and one title insurance professional. Five lawmakers are ranchers; two are farmers. Some unique professions among legislators include art dealer (Sen. Jim Dabakis, D-Salt Lake City); a Highway Patrol lieutenant (Rep. Lee Perry, R-Perry); and a low-voltage technician (Sen. Daniel Thatcher, R-West Valley City).